Most of us have fond memories of food from our childhood and food has a way of transporting us back to the past especially the biscuits, the toffees. Parle-G biscuits and Parry's toffees(green paper wrapped small little ones), orange mittai( round orange colored ones wrapped in transparent paper) were among the top listed ones. There were many organic and home grown veggies to add to that list too. My affair with tapioca as a child was hardly a month or two whenever we visited Kerala for vacations. And so my liking to the tuber never was much to be remembered. On the other hand, my sis was mad over tapioca.Gone are the days which will never come back, I wish the cycle just reverted for at least sometime to have some fresh tapioca plucked by our grandfather from our backyard. Tapioca (kappa) was a big no to me as a child and there was slight liking by adolescence. But to be frank, I was never mad after kappa even then and I was evem more elated to know (after marriage) that my better half also didn't like tapioca(kappa) much. However, as time passed or as we moved out to US where we hardly get fresh tapioca(not so often) that we realized we were missing our humble tapioca(kappa). We developed a better taste for tapioca(kappa) and H also started eating. Now, believe me we have become an avid fan of tapioca(kappa). But kids are still in our phase of childhood I feel, they do eat but not very fondly. Hoping that they may also start liking tapioca as they grow up. And in the mean time, I try out a few good recipes to sneak in kappa for them. This is one such recipe. 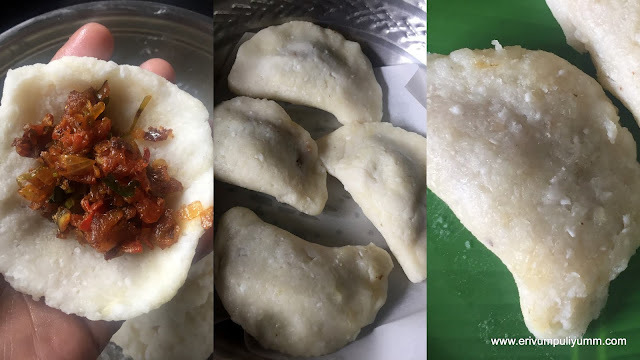 This is a similar recipe to meen pathiri but a little more easier and these kozhukatta have tapioca as the covering in disguise. Interesting right? 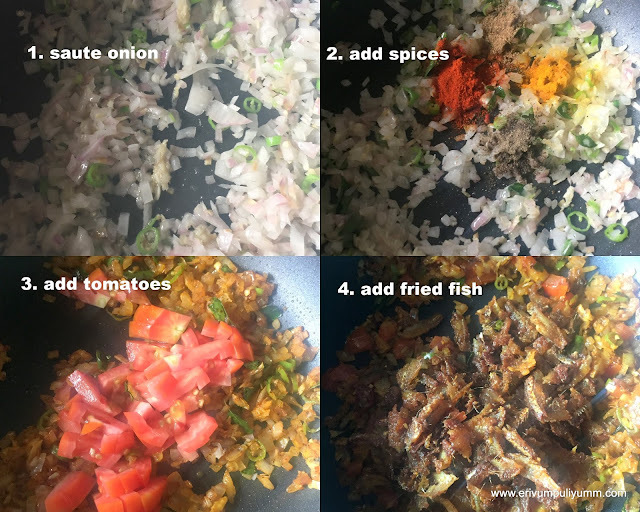 Yes, I made them as a after school snack for kids and they just gobbled them up in no time.They loved the filling of fried fish with mildly spiced masala and the outer covering tasted yummy as well with the coconut,tapioca and rice flour. Do give this a try if you love tapioca. Peel the skin of tapioca,cut in large cubes. Boil the tapioca like we usually do or refer this post link here to learn cooking tapioca. with enough water,cook it well and add salt. Leave to cool or use left over kappa puzhukku. In the meantime, make the covering. In a bowl, remove the stem of tapioca and any obvious fibrous strands. Mash it smooth( if the tapioca doesn't mash well then just go ahead and add the boiled tapioca to a mixer and pulse once or twice without adding any water). Now to this add coarsely ground coconut garlic mixture(garlic is optional, if you don't like the smell of garlic then omit it out. I add as it helps in digestion). Also, heat water in a pan and wait to boil. Add this water to the rice flour with salt in it. Make a dough like we do for idiyappam or kozhukatta. 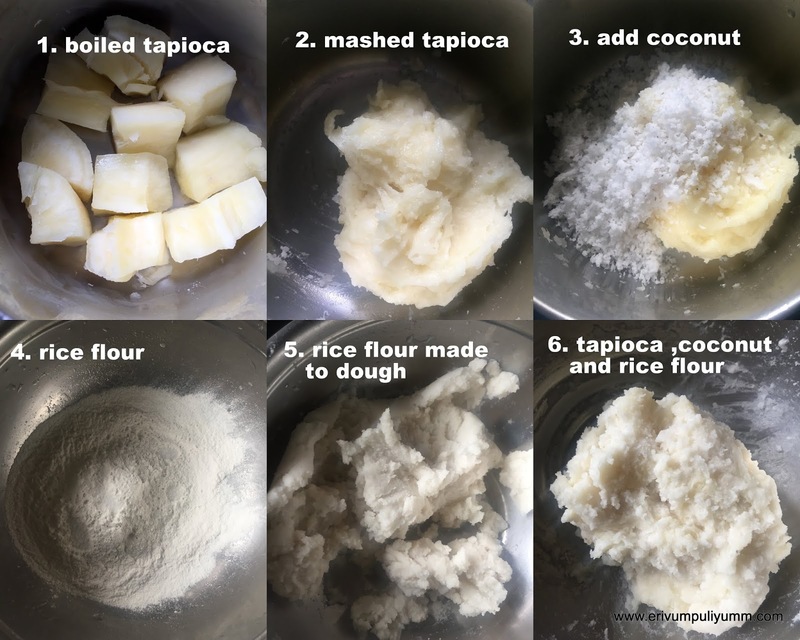 Mix this rice flour dough to the kappa(tapioca) mix once the rice flour dough is easy to handle. Knead to a nicely combined dough. The dough is a bit sticky unlike the kozhukatta dough. Wash the fish under running water and marinate the fish using the spices listed under fry. In a pan, fry the netholi(anchovy) with marination till lightly crisp(Don't overdo else the fried fish may turn hard). Remove on a plate and leave to cool. 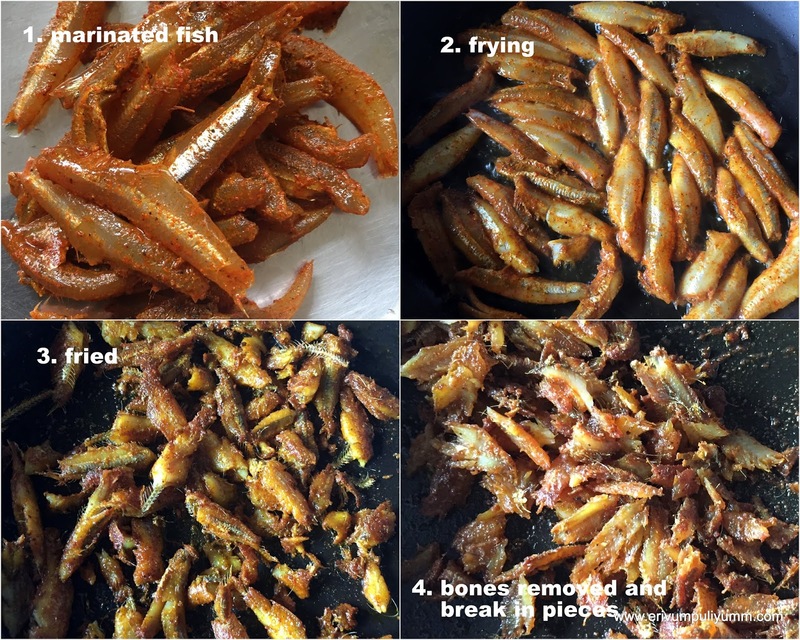 Once cooled, remove the prominent bones and break in small pieces. Keep aside. In a pan add oil,add ginger-garlic paste and saute till raw smell disappears. Saute onions followed by green chillies, curry leaves.Saute until the onion is translucent and slightly browned,add all spice powders listed under masala and give a quick stir. Add in the chopped tomato and saute until mushy. Cook covered for a minute and then add the fish pieces. Cover and cook for another minute on low flame. Then combine well and switch off flame. Once cooled add in the lemon juice. Now, start making the kozhukatta or parcels. Apply a little oil on your palm and scoop out a large ball (slightly bigger than lemon size). Flatten the dough in your palm using the fingers or place the dough on a oiled parchment paper or banana leaf. place a tablespoon of filling in the center and cover the filling in semi circle. Place in a steamer lined with parchment paper or aluminium foil or banana leaves. Repeat making rest of the kozhukattas and place them adjacent(Don't pile them one above the other as these may stick together and the filling may seep out). Steam cook for 7-10 minutes until done. Don't remove from the steamer immediately, wait for the steam slightly and to cool slightly. Gently remove on a plate. Serve warm just like that,enjoy !! * You can use plain rice flour kozhukatta if you stay in a place where you don't find kappa(tapioca). But tapioca has its own taste and flavor. * Try selecting the less fibrous variety which has one single strand of tapioca. In Thrissur, we get the kolli type tapioca which may not be suitable to make the covering of kozhukatta. * You can even use chicken or beef as filling and prepare the same kozhukatta. A non veg combo with kappa kozhukatta tastes yummy. * I have used netholi(anchioves) but you may use sardines or any small kind fish, they taste good. * If you have fresh banana leaves avaiable, then spread the kozhukatta mix as a layer on a piece of banana leaves like ada. Add the filling and close in halves. Steam cook in a steamer to make kappa ada. So delicious! I have never had fresh tapioca...wish I could taste some now, Julie. This looks like a really healthy and delicious meal.